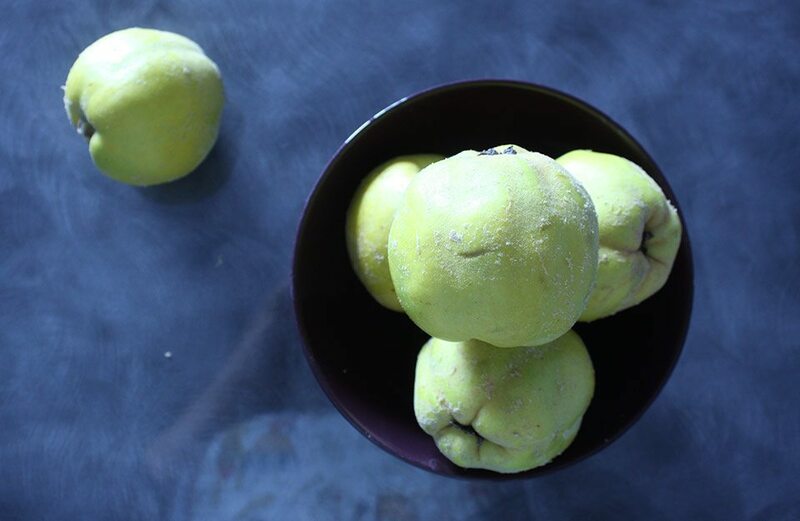 Around this time every year, quince magically appears in the market. They are almost hidden in a non-prominent corner of the produce section with other ignored exotic fruits. For years I overlooked it, puzzled by what its purpose would be in my kitchen. Quince is the red-headed step child of the apple, seemingly out of place, but special regardless. Somewhat similar in shape and color to an apple, but bumpy like a squash, furry like a peach, rock hard and inedible in its raw state. Alas, there is an answer. When cooked, it has a wonderful lemony sweetness, a bit tart and surprisingly rich. 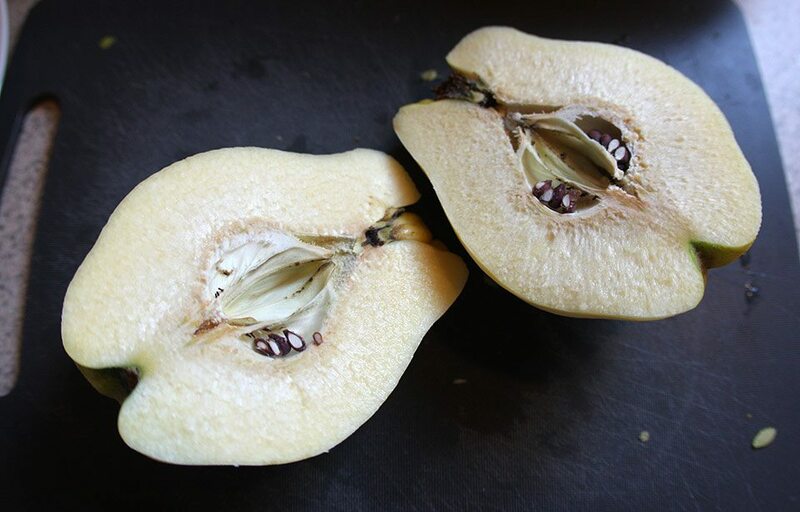 It can be used in place of an apple or pear in just about any pie, tart, crumble, etc. 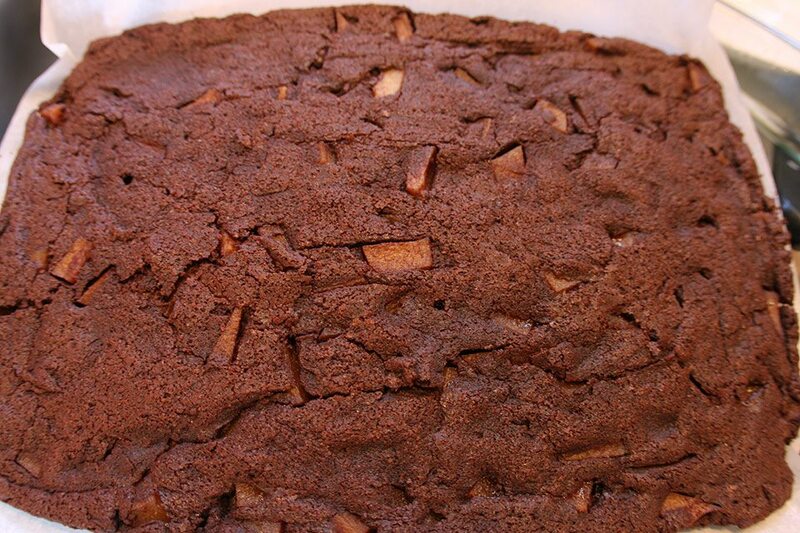 I say, what better place to put it than in a dark chocolate brownie. 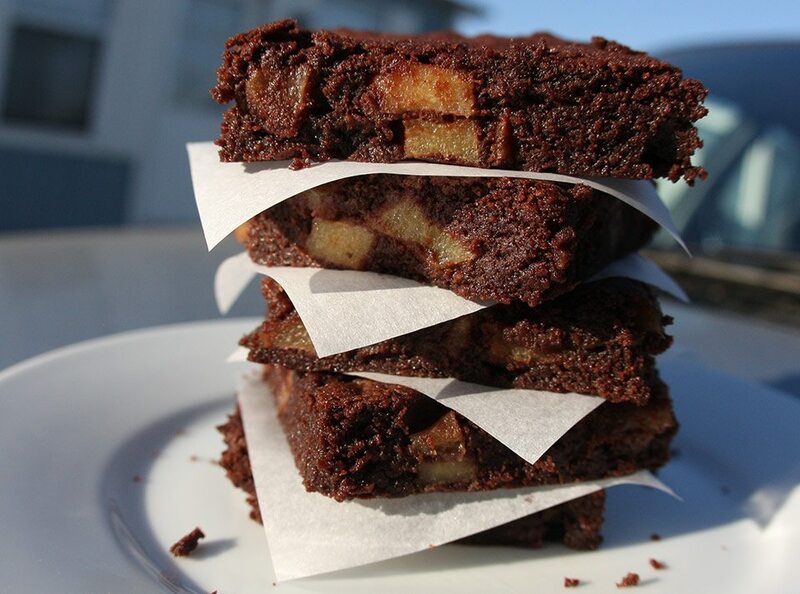 But don’t take my word for it, make the brownies for yourself. Come over to the dark side. Trim off the knobby ends of the fruit. Peel the quince. Cut the fruit in half, then cut each half in half again. With your knife at an angle, cut the core out of each quarter. That core is a biggin’ (that’s Southern speak for ‘freaking huge’, just in case that wasn’t clear). So after cutting out the core, there will still be some traces of it left. Use a melon baller or paring knife to remove the rest of the core. Now all you have is fruit! 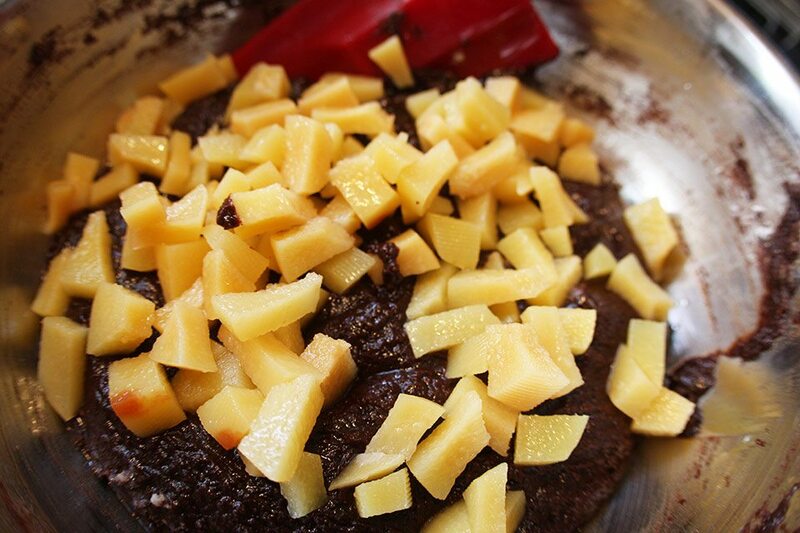 FYI – quince will discolor just like apples or pears, so toss with some lemon juice to prevent browning. Boil sugar and water in saucepan until sugar has dissolved. Reduce heat to a simmer and poach quince for 20m. Let cool in liquid while preparing the brownie batter. Preheat oven to 350F (175C). Grease a 9″x13″ pan with butter and line with parchment for easy removal. Fill a saucepan halfway with water. Boil the water, then reduce to simmer. Place a bowl on top of the saucepan. This, uh, contraption is called a ‘bain marie’. It’s a method used for gently heating ingredients that cannot handle direct heat. In this case, it’s used to melt the chocolate as it can burn easily. 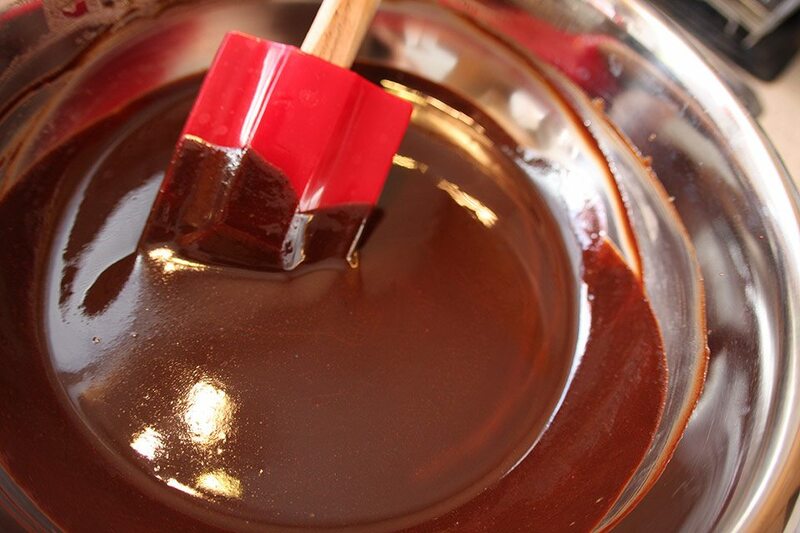 Add the chocolate and butter to the bowl over the bain marie, stirring occasionally until melted throughout and smooth. Remove bowl from over the saucepan. 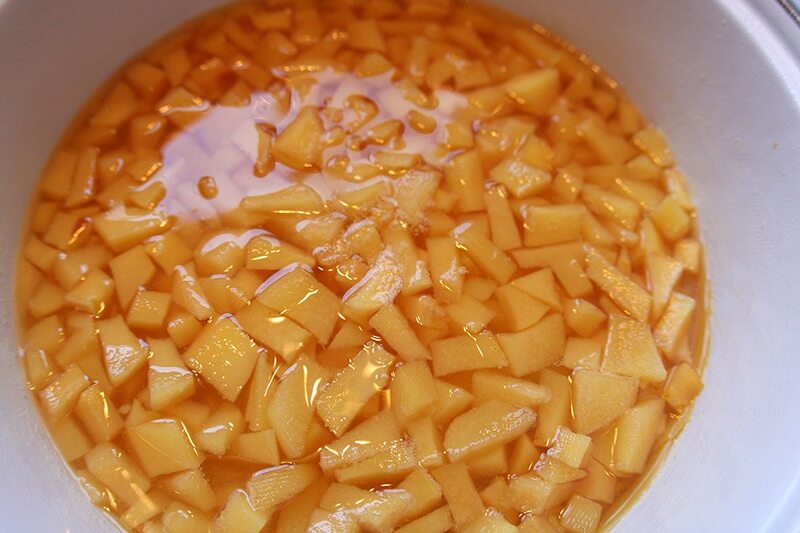 Stir in sugar and vanilla extract. Once mix has cooled slightly, whisk in eggs, one at a time. Add flour and salt, whisk or fold just til combined. Add drained quince. Fold in fruit. Spread batter into pan. Bake for 30 to 35m, until toothpick inserted in center comes out clean. If using a glass pan, add 5 to 10m to baking time and reduce temp to 325F. Cool. I like to refrigerate the brownies before cutting as they are on the fudgey side.